Well, my dh has gone out of town, so his side is the bed is filled with stitching stuff. I have canvas work, cross stitch and knitting! I have been working on a little bit of everything today! I finished up a sock yesterday - it fits perfect and I love it! I'm anxious to get started on the second one now. It looks huge, but it's really not. It's just the angle in which the picture was taken. I have also been working on another canvas work piece. 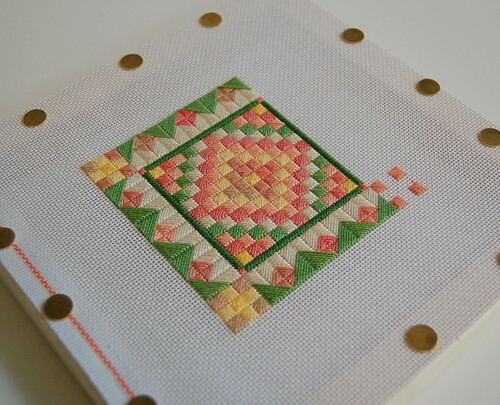 This is a freebie by Laura J. Perin called "Grandma's Flower Garden." Which you can find here (scroll down). I have also rejoined the Celtic Lady SAL. I got Celtic Autumn back out and stitched on her just a bit tonight. I know I really should be finishing up my neighborhood, but I think I'm feeling a little anxious about Hanna. Although all we've had so far is rain - no wind. Hopefully it stays that way. 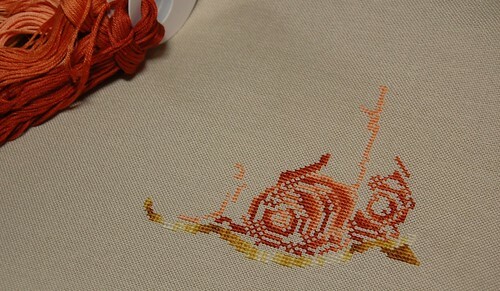 Hi, Nicole, as always, you do such beautiful work with such yummy projects in gorgeous colors! Best wishes on the storm--beginning to rain here in Virginia also--we're supposed to get the worst of it tomorrow a.m. I'm crossing my fingers about the wind also--I hate that awful shrieking/moaning thing it does when it's blowing scarily hard. Your sock is gorgeous along with your canvas work! I bet you thought you would be pretty much out of harm's way when you moved out of Florida, eh? All of these storms are taking a toll on me. I check the National Hurricane Center every 3 hours for the newest updates. I'm not liking the path it's looking like Ike is going to take :/ But anyway, I've been stitching alot and loom knitting to keep my mind off of it! I worry too much. I love to visit your blog and see all your new socks. You have given me inspiration to pull out my knitting needles and try a pair of socks myself. Be safe with the upcoming storm. I'm up here in CT and we are suppose to feel it's effects sometime late Saturday night or early Sunday. It will make for some good stitchin' time. 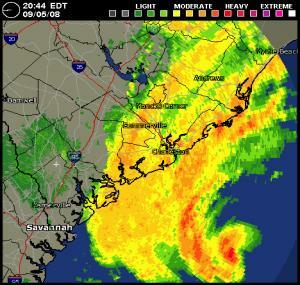 Hi Nicole: I am watching CNN and they showed your South Carolina and it looks like you are getting the storm. I am thinking of you and hoping everything will be fine. We have had some of this here too but no wind so far with ours. I love your sock and your Grandmother's Flower Garden. Go to http://two-handedstitcher.blogspot.com/. That is Laura J. Perin's blog and the logo on top is a canvas project that she has designed a pattern for. I may have to get the Lone Star House sometime after seeing it there. I love so many of the patterns it is hard not to want them all! Be safe and take care! Let me know how you are doing in the storm this weekend! Your sock and canvas work look great ! Hope you don't get hit too hard with the storm. I love all your canvas work pieces, they are so colourful and pretty. I hope you get some sleep and that nasty Hannah leaves you alone! Ooo, lots of crafty goodness there. Great sock :o) And I love your canvas work - that is so pretty. Great stuff you rejoined us and pulled out Celtic Autumn again. Hoping Hanna doesn't cause you any major problems. Stay safe. Stay safe Nicole! I'm soo weary over these storms. I think I watched 150 hours of weather channel last weekend. I'm sure more of the same is on tap for me this weekend. Just remember, if Jim Cantore shows up in your town it's probably not a good thing.... I want the storm panels off my lanai windows, it is so dark and dreary back there. For some reason DH does not think it is time effecient to take the storm blankets down just so we have a place to stitch! Love your sock. I know you will get the mate stitched quickly. Do you have any plans for your left over sock yarn? One of the EGA girls is collecting OROSY (odd remnants of sock yarn!) and knitting a really cool afghan. I'll accept contributions for her! 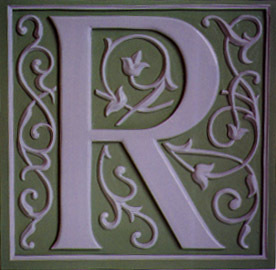 I'm in search of beachy type house/building patterns for my neighborhood RR piece, do you have any suggestions/ideas? Stay safe! Stitch lots! Miss you! Sorry for the long comment! Very pretty work on all. Good thoughts for the weather. All the work you posted is beautiful--love the colors in the Celtic Autumn piece, and I so want to learn to knit a beautiful sock like that! The canvas work is so pretty too! Hi Nicole! All of your crafty projects look so very pretty~I admire you for your knitting abilities, the sock is perfectly perfect~and especially so since it's a nice fit. :-) I have all of the Celtic Ladies kitted up, and have been thinking lately that I should stitch one for each of our Triplet Granddaughter's. Maybe personalize each one with their name's. Your Celtic Autumn is already breath-taking. Can't wait to see this one progress. Stay safe from the storms. DD in NC pretty much said that all they had from Hanna, was a rain event. I hope you stay safe!! We have had a LOT of rain from Hanna today. Great sock finish and your canvas work is gorgeous! Those canvas pieces are just lovely. They all appear to be so bright and uplifting. That sock is wonderful...I love that red and I'm not usually a red person.